In line with its stated aim to create a transparent and professional real estate market with clear and measurable standards, Dubai Land Department ( DLD ) has announced the launch of unified real estate contracts. The new agreements have been designed to regulate the relationship between the parties involved in property transactions and to avoid problems that arise from misinterpretation with documents, such as liability and fault. In addition, the new procedure will help facilitate and accelerate the processes of buying and selling in the real estate market, especially as it allows the completion of registration procedures without the need to use an agent. DLD’s unified real estate contracts protect the rights of the three parties in any real estate transaction; the buyer, the seller and the broker. The contracts will become a mandatory requirement starting May 1, 2014. “After an extensive study on the services we provide to our customers that we conducted in order to improve our performance, we came out with the decision to unify the real estate contracts to properly organise the relationship between the various parties. “The new agreements will also help us to rid of some of the problems that may occur because of a lack of clarity,” said Sultan Butti bin Mejren Director General of DLD. The unified real estate contracts will be accessed via the Dubai government E-mart website (www.emart.gov.ae), where it will provide customers with three models of unified contracts; a contract between seller and buyer (F), a contract between seller and broker (A) and a contract between buyer and broker (B). The documents can be downloaded immediately from the site and be filled with the required data for each transaction before being signed by the relevant parties. The contract becomes formal and completed after it has been recorded and documented at DLD. 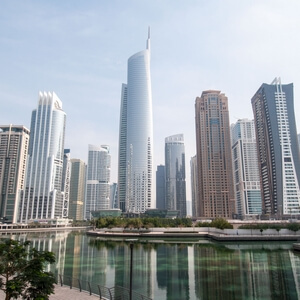 In its announcement, DLD stressed that its unified real estate contracts will be used officially from the beginning of May 2014 in all transactions that relate to the buying and selling of property. The department is currently providing models of the new contracts on the Dubai smart property marketplace, E-mart. This important new document contributes to the enhancement of the competitiveness of the real estate market in Dubai and moves it to a new phase of leadership and excellence by establishing the principles of transparency and professional standards. It will be of great value in assisting us to keep pace with the real estate boom currently taking place in Dubai and will promote confidence in the market generally,” he added.